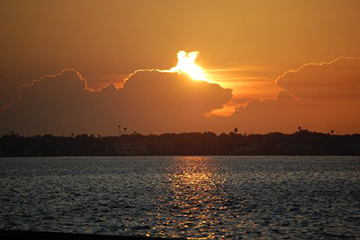 The longest day of the year has come and gone, and we are now approaching the 'Dog Days' of summer. Ever wonder why they are called that? The phrase links to astronomy and the appearance of the constellation Canis Major and the star Sirius, known as the Dog Star. The stretch of days in July and August gets the name because Sirius begins to line up with the sun in the Northern Hemisphere. In ancient times, it was believed that the sun and star combined their energy to make the temperature even hotter. We know this isn't the case, but the term stuck and is used often during the summer months. 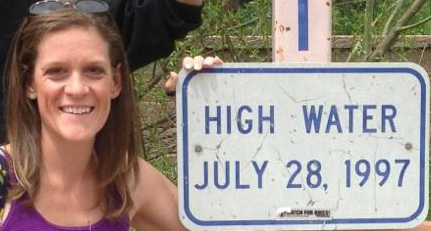 FL-SW-1 on 6/4/2015: "The high was 89.02 degrees F and the low was 68.29 degrees F. Heard very faint thunder from approaching rain from the North around midnight. Storms were headed south until the wind shifted and took them East. The cicadas are starting to appear." 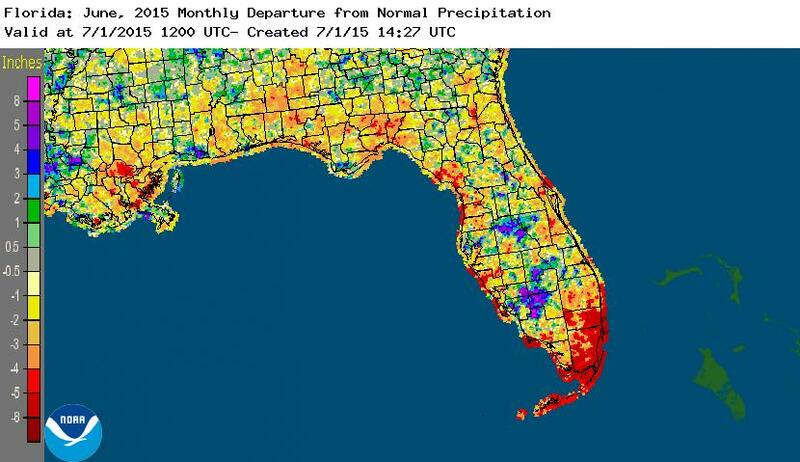 FL-PK-22 on 6/12/2015: "How about that NO RAIN!" FL-ST-12 on 6/4/2015: "Moderately heavy rain began at 4:27 PM, preceded by many, loud thunder claps, some of which sounded directly overhead. By 5:15 PM the rain had stopped, the sun was shining, and the reading was 0.53". I heard heavy rain again sometime during the night." FL-SJ-21 on 6/29/2015: "There was two thunderstorms yesterday. They both brought heavy rain, gusty winds, and very loud thunder. We got some flooding when the second storm came through. The road was completely covered in one area. We get flooding like this about 5-6 times a year." During the month of June, the National Weather Service focuses on rip current and lightning safety awareness weeks. This is a good time to review the excellent information and resources that the NWS has pulled together for not only yourself, but for any visitors coming to the Sunshine State. A rip current forms when waves break near the shoreline, and some of the waves break stronger in some locations than others. This causes a circulation of fast-moving water that travels back offshore. Even the most experienced swimmer can get caught in a rip current and be unable to break free. So far in 2015, 15 people have lost their lives from rip currents along Florida beaches. There are signs posted at most beaches of a diagram of what a rip current looks like and what to do if you're caught in one. In addition, the state of Florida has a beach flag system describes the surf condition based on a color scale. Florida is the lightning capital of the continental United States, with some portions of the state seeing an average of more than 30 strikes per square mile each year. Since May, 3 fatalities from lightning have been reported in the state. The summer months mean increased outdoor activities, so remember, "When It Roars, Go Indoors." 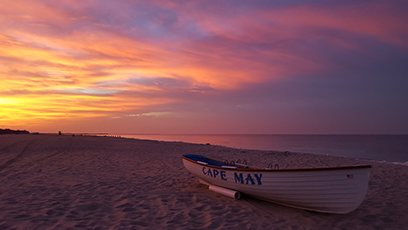 At the end of June, I boarded a plane and headed off to Cape May, NJ for the annual meeting of the American Association of State Climatologists. This year, there was a special session that highlighted the 125th Anniversary of the NWS Cooperative Observer Program. Nolan was unable to attend the meeting but recorded a video about the history of the program - and, of course, gave a shout out to CoCoRaHS observers. 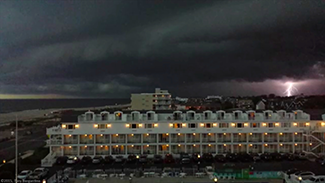 The evening we arrived in Cape May, a line of severe thunderstorms moved through the area, and my friend (and Wyoming CoCoRaHS Coordinator) Tony Bergantino caught this amazing shot of lightning as the storm approached. The following morning I was able to capture this beautiful sunrise over the island. While in New Jersey, I did some bird watching and visited one of the wineries in the area. It was a wonderful trip, and next year's meeting will be in scenic Sante Fe, NM. 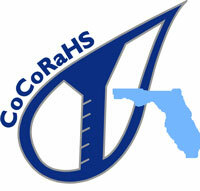 We are lucky enough to see these pictures shared by Florida CoCoRaHS Observers here in the Sunshine State. 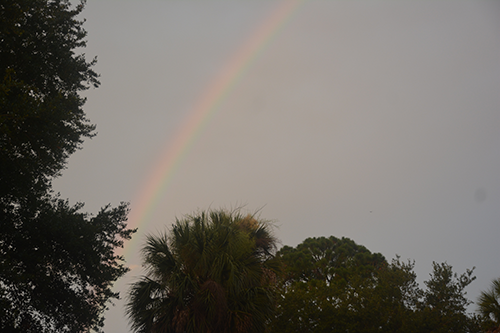 Don from Hillsborough County shared the picture of sunrise behind clouds off to the east, and Ric from Brevard County sent in this picture of rainbow near his home on the 25th. If you've got any pictures you took on your travels -- rainfall, floods, drought impacts, beautiful sunrises and sunsets, or anything else you'd like to share -- please send them to me. 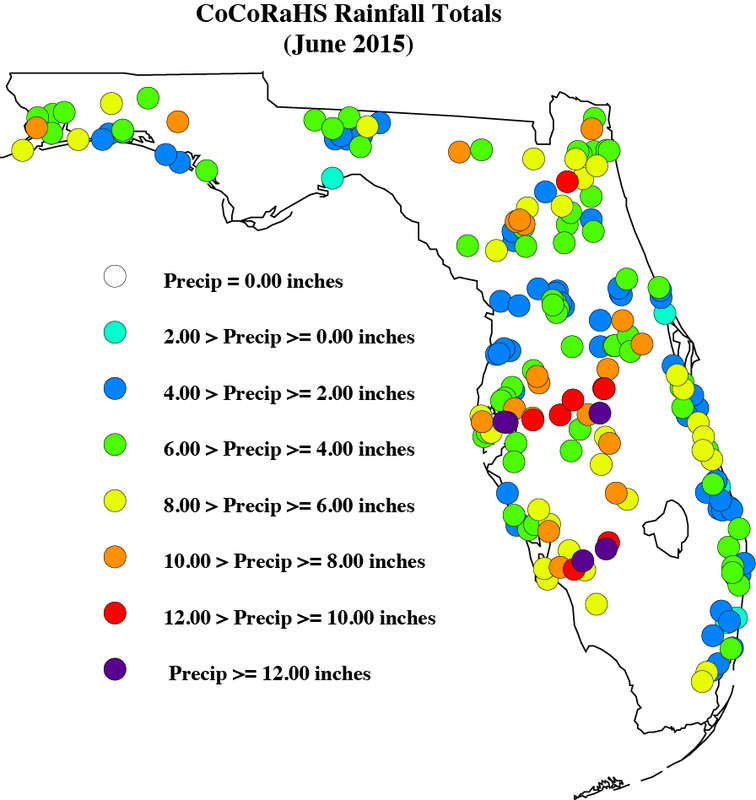 With the exception of some interior portions of the Peninsula, especially around Polk County and counties east of Lake Okeechobee, the majority of the state had rainfall totals below normal (Figure 1). 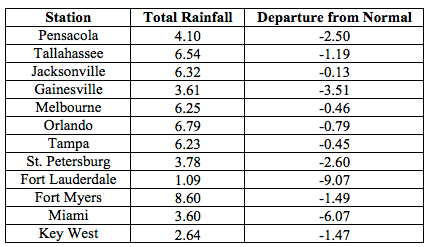 Departures from normal roughly ranged from -9.07" to -0.13" (Table 1), though localized parts of the state saw rainfall totals that were as much as 8.00" below normal to 8.00" above normal (Figure 1). There were multiple 24-hour precipitation records broken for the month (Table 2). Table 1. June precipitation totals and departures from normal (inches) for selected cities. 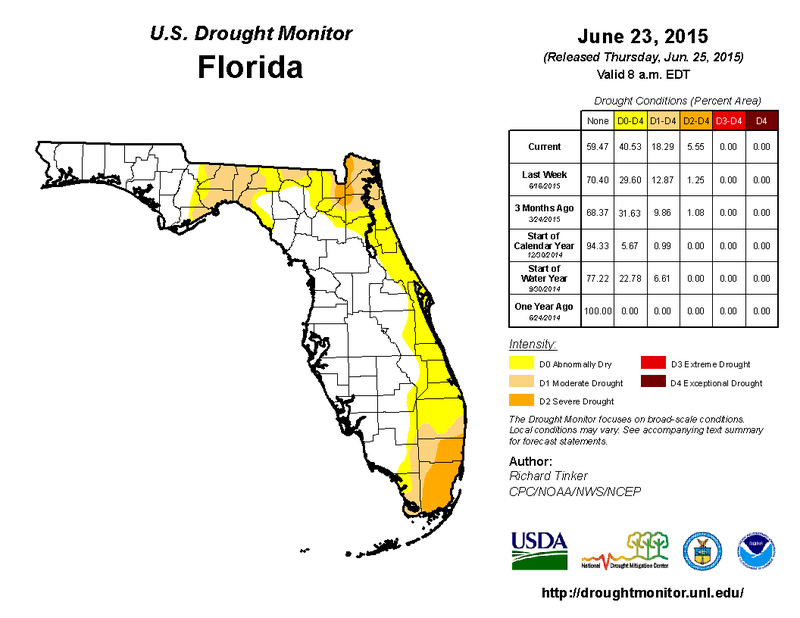 At the end of May, nearly 13% of the state was experiencing abnormally dry (D0) conditions, mainly concentrated in portions of northeastern and southern Florida. As June progressed, the lack of rain and warm temperatures did little to ease drought conditions. The area of D0 along with portions of the moderate drought (D1) in South Florida expanded, and severe drought (D2) was introduced into Dade County. By the middle of June, the area of D0 expanded from the northeastern portions of the state (near Jacksonville) into the Big Bend, and with the continued below normal precipitation in that area, D1 was introduced. The June 23rd release of the Drought Monitor introduced D2 in part of the Lower St. Johns and Nassau/St. Mary's river basins. In addition, the eastern coast of the state from Nassau County to the Keys has now been classified as experiencing at least D0 drought conditions. The area of D2 conditions in the southern part of the state expanded outside of Dade County and is now being observed in Broward County. Based on census data, roughly 6 million Florida citizens are currently being impacted by drought conditions reported in nearly 41% of the state. At the end of the month, the water level in Lake Okeechobee had dropped to just over 12 ft., mainly due to lack of rainfall across the basin.